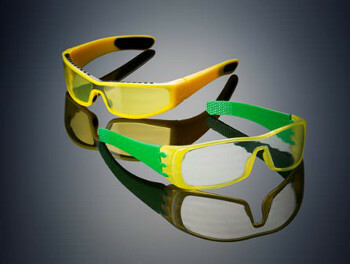 Glasses 3D printed on the Objet500 Connex3 Color Multi-material 3D Printer using Opaque VeroYellow (the frame), rubber-like black (TangoBlackPlus – also on the frame), and a unique translucent yellow tint (the lenses) in one print job – no assembly required.Stratasys Ltd., a manufacturer of 3D printers and materials for personal use, prototyping, and production, has launched the Objet500 Connex3 Color Multi-material 3D Printer which it claims is the first and only 3D printer to combine colours with multi-material 3D printing. The company believes the new printer will be a game-changer for product design, engineering and manufacturing processes. It features a unique triple-jetting technology that combines droplets of three base materials to produce parts with virtually unlimited combinations of rigid, flexible, and transparent colour materials as well as colour digital materials - all in a single print run. This ability to achieve the characteristics of an assembled part without assembly or painting should prove to be a significant time-saver. It will help product manufacturers validate designs and make good decisions earlier before committing to manufacturing, and bring products to market faster. "Stratasys' goal is to help our customers revolutionize their design and manufacturing processes," said Stratasys CEO, David Reis. "I believe our new Objet500 Connex3 Color Multi-material 3D Printer will transform the way our customers design, engineer and manufacture new products. In general and with the Connex technology in particular, we will continue to push the envelope of what's possible in a 3D world." Engineers at beta user Trek Bicycle in Waterloo, Wisconsin, USA are using the Objet500 Connex3 Color Multi-material 3D Printer for assessment and testing of accessories like bike chain stay guards and handlebar grips prior to actual production. "The Objet500 Connex3 Color Multi-material 3D Printer changed the way we manufacture at Trek, augmenting our traditional, time-consuming CNC processes with fast, iterative and realistic prototyping and functional testing," added Mike Zeigle, manager of Trek's prototype development group. Similar to a 2D inkjet printer, three colour materials - VeroCyan, VeroMagenta and VeroYellow - are combined to produce hundreds of vivid colours. These colour materials join Stratasys' extensive range of PolyJet photopolymer materials including digital materials, rigid, rubber-like, transparent, and high temperature materials to simulate standard and high temperature engineering plastics. Bicycle helmet 3D printed with VeroMagenta and VeroCyan in one print job on the Objet500 Connex3 Color Multi-material 3D PrinterThe Objet500 Connex3 Color Multi-material 3D Printer also features six palettes for new rubber-like Tango colours, ranging from opaque to transparent colours in various shore values to address markets such as automotive, consumer, sporting goods and fashion. "Since its introduction in 2007, the Objet Connex Multi-material 3D printing platform has paved the way for the development of advanced 3D printing materials with unique mechanical and thermal properties," explained Stratasys VP of product marketing and sales operations, Igal Zeitun. "The Objet500 Connex3 Color Multi-material 3D Printer produces models and parts using photopolymers in vivid colours so you can create colourful models from investigating concepts to pre-production pilot runs. "As the first true multi-purpose 3D printer, we believe the Objet500 Connex3 Color Multi-material 3D Printer is in a league of its own, enabling you to dream up a product in the morning, and hold it in your hands by the afternoon, with the exact intended colour, material properties and surface finish." 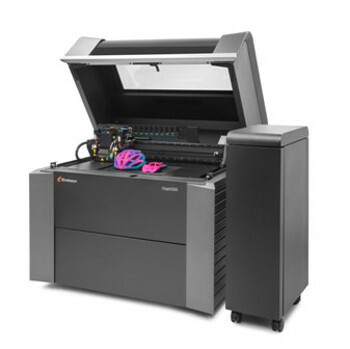 The Objet500 Connex3 Color Multi-material 3D Printer is commercially available today and is sold through Stratasys' extensive worldwide reseller network.